The Digital Research Library of Illinois History Journal™: A Chicago Artilleryman's Account of the Battle of Shiloh. "Our Wish for a Hard Battle." A Chicago Artilleryman's Account of the Battle of Shiloh. "Our Wish for a Hard Battle." The Battle of Shiloh took place on April 6-7, 1862 in southwestern Tennessee. It was also known as the Battle of Pittsburg Landing to southerners. The Union army was led by Major General Ulysses S. Grant and he faced Confederate forces under Generals P.G.T. Beauregard and Albert Sydney Johnston. Civil War soldiers were closely bound to the home front. Letters, packages of food, and visits from friends and loved ones were common. For the first year of the war the front for most Illinois soldiers was located in the neighboring states of Missouri, Kentucky, and Tennessee. Because people back home in Illinois kept in close touch with the troops, shifts in the attitude of the soldiers were followed by shifts in popular perception of the war. In the spring of 1862, Illinoisans were naively optimistic about the progress of the war. Ulysses S. Grant's victories at Fort Henry and Fort Donelson had secured a large portion of Kentucky and Tennessee for the Union. Soldiers and civilians alike looked forward to a large battle as a means to kick out the last props on the rotten Confederacy. They saw battle as a test of valor and thought in terms of wars won and lost in a single Waterloo-like contest. This letter is a window into a common soldier's reaction to the trial of battle and the shock that courage and Christian soldiering were no guarantors of victory. 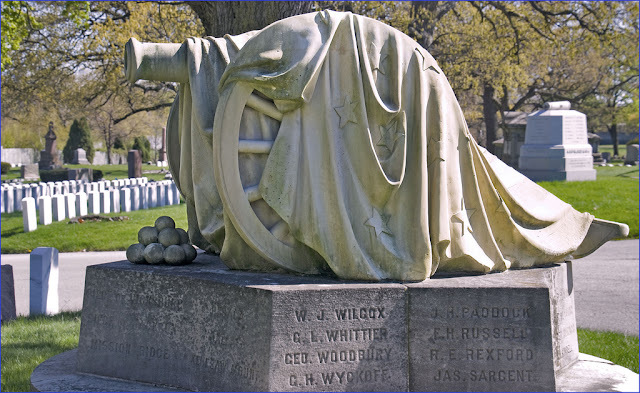 James Milner was a young artilleryman in the Chicago Light Artillery (later Battery A, 1st Illinois Artillery). The letter which was originally a private communication to his father, Robert Milner, was printed in the Chicago Tribune on Friday, April 18, 1862. James Milner enlisted in the army immediately after Abraham Lincoln's call for volunteers. The unit was made up of middle class Chicagoans, many of whom were members of the YMCA and the St. James Episcopal Church in Chicago. There is a memorial altar to the unit's dead in the vestibule of St. James and a beautiful Leonard Volk sculpture in Chicago’s Rosehill Cemetery on which is inscribed the names of the men Battery A lost at Shiloh. "The Sabbath dawned upon us clear and warm," Milner wrote. His unit was camped in a meadow as part of Brigadier General William H. L. Wallace's Division. While watering the battery's horses, Milner heard firing in the distance. The unit quickly harnessed the horses and limbered the guns. They were immediately sent forward to the rapidly forming Union battle line. Capture of Union forces at Pittsburg Landing, Tennessee, by Confederates, Sunday, April 6, 1862. Although the men had seen action at Fort Donelson, they were by no means veteran troops. As they came under fire, they laughed at each other for involuntarily flinching. The laughter stopped when Sergeant Jerry Powell had his arm ripped off by a Rebel shell. Throughout the morning, the battery was engaged - hurrying from one crisis to another - trying with little success to break the Confederate advance. Repulsing the combined Confederate attack at the Peach Orchard, Shiloh, Tennessee, Sunday, April 6, 1862. The fighting took a heavy toll on the battery. Out of ninety of the men who went into action thirty-two were killed or wounded. "Ed Russell, a young man whom you have seen behind the counter of Smith's bank, as gentlemanly a man as we had in the battery, had his bowels torn out by a solid shot. He lived but a half an hour. His last words were as he lay on his face, 'I die like a man.' And good man Farnham, a Christian man, my tent-mate for six months...was shot through above the heart... Flanigan a merry hearted Irishman and the intimate friend of Ed Russell, was shot through the mouth." At this point, the infantry fighting in front of the battery broke and ran. Their fighting took them across the battery's field of fire. "We yelled at them to keep away from our fire, but they didn't hear. I ran forward and waved my hat, but to no purpose, and I went back to my post and fired through them." The battery's own retreat nearly cost them their howitzer. Under the direct fire of the enemy, the men struggled to sort out the tracers amid dead and panicked horses. "We saved the howitzer, having eight men wounded in the performance." After trying one final try to help stem the rebel tide, the battery again limbered their guns and joined the retreat to Pittsburg Landing on the Tennessee River. Reccapture of Union artillery by the First Ohio Regiment at Shiloh Church, Monday, April 7, 1862. "I now knew we were beaten and in full retreat. I stopped, and with the aid of some infantry, helped one of our guns out of a mud-hole, and walked on till we came to a road jammed with wagons: I felt then I had never witnessed so painful a sight as a disorganized army. Here I found Billy Williams...riding in a baggage wagon. He said to me in a pitiable tone, 'Jimmy, won't you come take care of me, I am shot through?' I had to refuse. This was truly painful. I helped him down and put him into an ambulance." In the wagon, Milner discovered another wounded comrade, Jerry Paddock. "I got into the ambulance and examined Paddock's wound, I found that he was shot through the liver, and that there was no blood coming through the wound, I made my mind he was bleeding internally, he was very frail, and I thought he must die. I put his handkerchief over his wound and went back to my gun." Under the shelter of the high bank of the Tennessee River, Milner saw hundreds of panicked men, "neither eloquence of speech nor cursing could induce them to go to the front." Battery A was placed into the center of Grant's last-ditch battle line. As darkness fell, the Union soldiers at one end of the line, although they had fought and lost all day, signaled their determination to resist what they thought would be a final rebel onslaught by issuing a "tremendous cheer." At that moment, there was a lull in the firing "and the cheer was taken up and echoed along the whole line and among the straggling squads of disorganized troops." During the long, wet nightmare night that followed, the men of Battery A talked about "the boys" who had died. "My heart was rilled with hatred and revenge against the enemy... I could not restrain my tears and felt that I would hazard my life in any position to mow down their ranks with canister. After this I had a feeling of utmost indifference as to my fate." "With the light of day the battle was renewed. We had recovered nearly all the ground lost the day before. The fire opened fierce from the start, and we did not wait long for orders to the front. Our position was near the center, and we commenced shelling with the four guns we were still able to man." At one point, General William Tecumseh Sherman personally directed the battery forward to stem a Confederate counterattack. No sooner had that action ended when: "General Sherman again rode up and ordered us to a new front 'Come on,' he said, 'I'll lead you,' and he did. We limbered up, mounted our seats...and we galloped forward through a fierce storm of shell and bullets. 'Well up to the front,' said Lt. Wood, and we took up position in advance of the infantry and poured in a rapid fire of shell. General Sherman who (as Gen. Wallace says is perfectly crazy on the subject of artillery) told a Louisiana officer in the presence of one of our men, it was the grandest thing he ever saw done by artillery... It was the liveliest engagement of all, for the time it lasted, and I really enjoyed it." With the help of reinforcements from General Don Carlos Buell's Army of the Ohio, Grant was gradually able to push back the Confederate Army. At 3:30 p.m., General Pierre G. T. Beauregard was forced to order a general retreat, but the Rebels were not the only soldiers who had reached the end of their tethers. Just before the moment of victory, Milner wrote that: "We were tired out. The rain was falling, and I for one felt more dispirited here than at any other time." No sooner did they retrieve a few crackers from their haversacks than the men noticed cavalry rushing to the front "and we knew that the enemy were in retreat." Battery A was again ordered to the front as part of a general effort to pursue the enemy. Two days after the battle, Milner wrote to tell his father he had survived. "I have gone into these tedious details to show you exactly what war is. I have since rode over the whole battlefield, but will spare you the horrid and disgusting details of the thousands of suffering wounded, and mangled corpses I saw." Shiloh altered the young Chicagoan's view of war: "We have at last had our wish for a hard battle gratified and never again do I expect to hear the same wish from the lips of our men. We are just as ready now to do our duty as we were, but to desire another hard battle, with the same chances of loss to our company, is quite a different thing." The account of James Milner provides insight into the reaction of Illinoisans to the shocking reality of the battle of Shiloh. The battle was a turning point in Midwesterners' attitudes toward the Civil War. Shiloh took the lives of more Americans than had died in all the previous wars fought by the United States. Before the battle, Grant had believed the rebellion was on the brink of defeat. After the bloody two-day contest, he realized that the Confederacy would yield only after a long, difficult war of conquest. Shiloh steeled Midwesterners to the painful truth that the Civil War would be a long, drawn-out conflict. After Shiloh, many Chicagoans assumed a much harsher posture toward the South. The editors of the Chicago Tribune likely printed Milner's letter to his father (against the young soldier's expressed wishes) in order to give readers a clear sense of the trial of battle and to stir in them the same reaction the death of his comrades aroused in Milner "revenge." Letters from other soldiers also began to make their way into the press with rumors of rebel atrocities. Confederate guerrillas were reported to have cut the nose and ears off a captured Union soldier. Other stories recounted poisoned wells, the refusal to bury Union dead, and the "making of tools and utensils of their bones." As the enemy became demonized, more and more voices on the home front and in the army began to call for harsh measures against all Rebels. "I begin to think the better way would be to utterly desolate wherever we went," an officer from Elgin, Illinois, wrote home. "If I had control when this army had marched through the Gulf States no landmarks would be left to show the boundaries of the towns, counties, or states." Shiloh began the evolution of the Civil War toward total war. Editing by Neil Gale, Ph.D. Note: Milner's account of the Battle of Shiloh appeared in the April 18, 1862, edition of the Chicago Tribune under the headline: "The Pittsburg Battle." Thank you for the time you took to publish this.